but today, I'm thinking cozy and warm. Well, come on in and make yourself comfortable. I'll brew us a pot of tea. This is my comfy corner, where I like to curl up with a good book (or blog.) I made the slipcover using an oatmeal linen fabric. It really transformed this room, since it used to be all red. 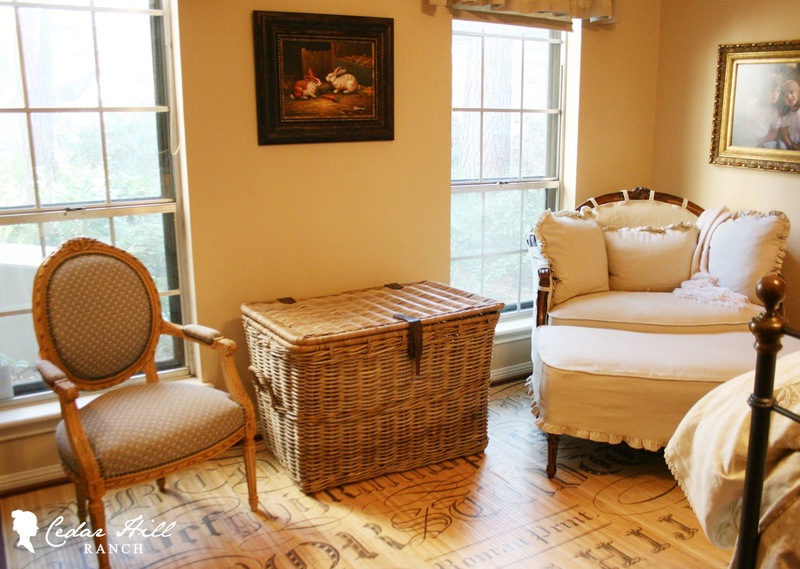 The big basket not only adds some texture to the room, but it holds the bedding and pillows at night. (And the rule is, if it doesn't fit in here, then it's too much stuff.) It also serves as a nice table to hold our tea cups. You can sit in the settee, no really... I insist. I'll sit in the blue chair. I love this bamboo graphic rug that adds some visual interest to the room. This hand-carved Louis XIV chair on the left was a big find on Craigslist. It didn't need a thing. 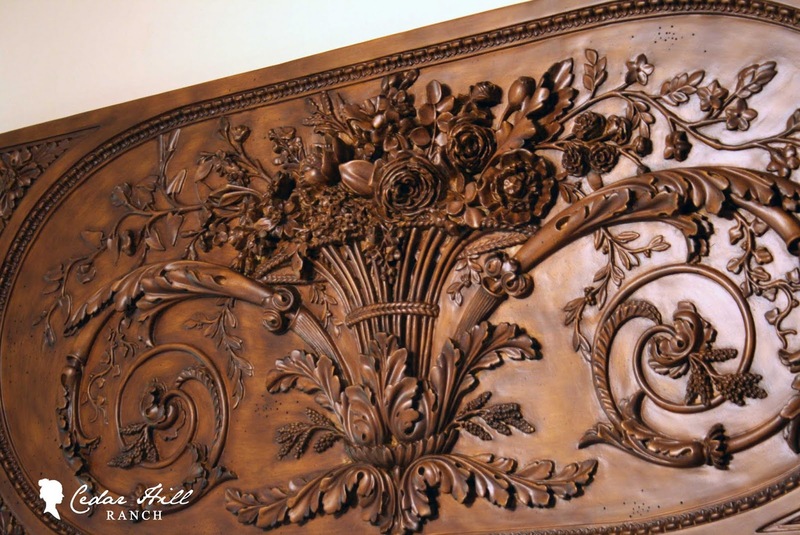 Look at all that hand-carved detail. 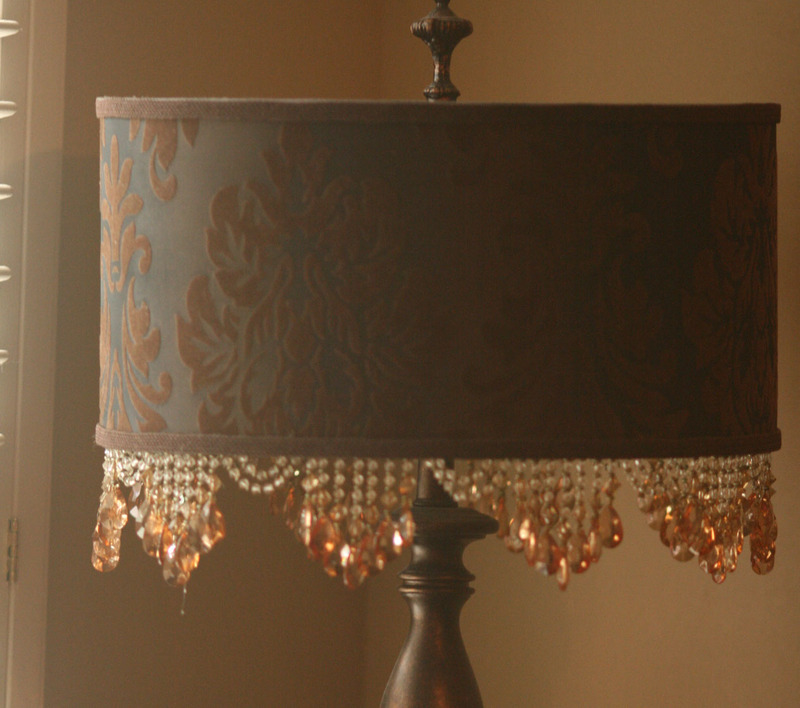 The lamps with the damask lampshades and beaded fringe are among my favorites. The large size adds scale to the room. They are so feminine but Mr. CH accepts them in the room, since they are not pink, but a manly chocolate brown with frou frou fringe. The bed is covered in bedding that I also made from the same linen fabric. I also made the valences and roller shades for the room, click here to see more. 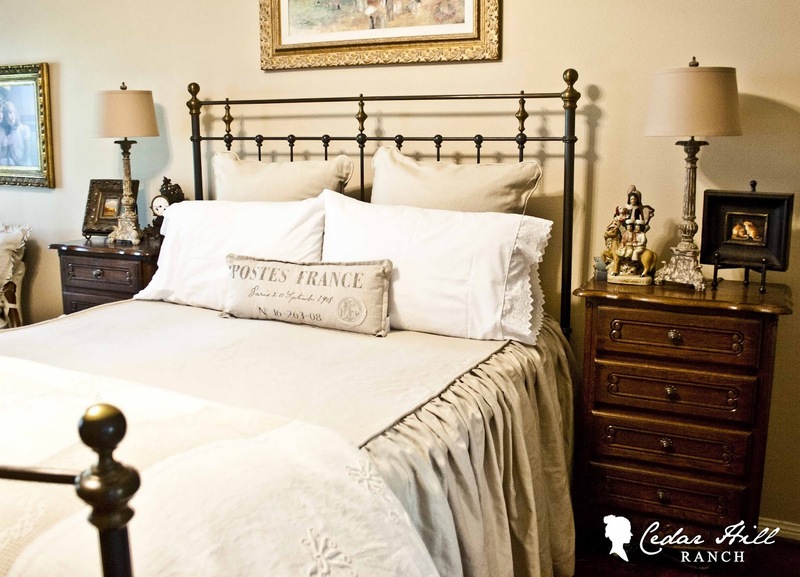 The duvet at the foot of the bed is covered in an antique French bedspread detailed with delicate embroidery and lace. On my side of the bed is one of my favorite pieces that I don't think I have shown up close before. 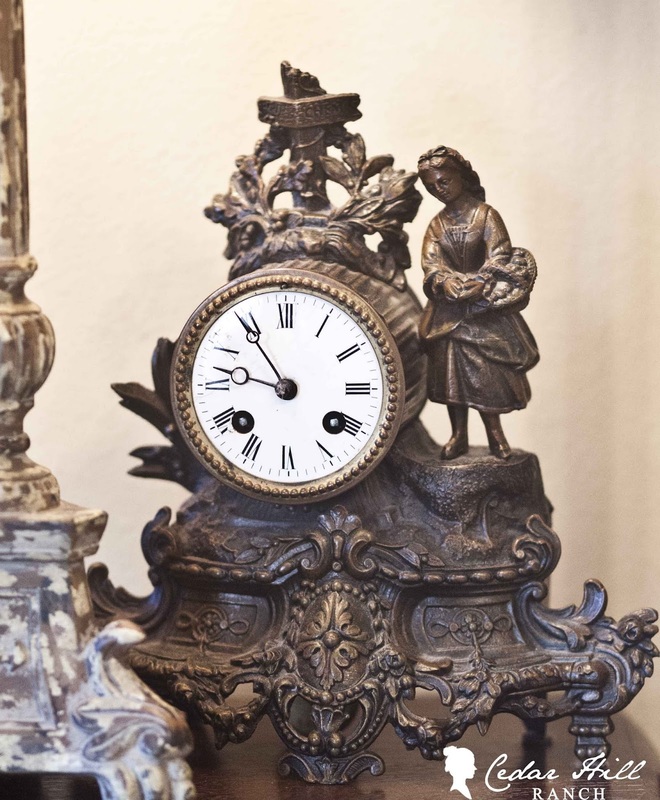 It's a antique French clock with such charming detail. It doesn't actually tell time right now, but apparently French clocks are very delicate and difficult to keep working properly. I don't really mind though, I use my mobile phone to see what time it is any way. The lamps next to the bed are Aidan Gray; I think I love everything they make. The plaque above the bed is from Ballard Designs; I have always loved this piece and grabbed it last summer when it was on sale. The piece on the other side of the room is a French bonnetiere. I didn't like the pediment, so I removed it. That way, you can really see the antique wicker trunk I placed on top. 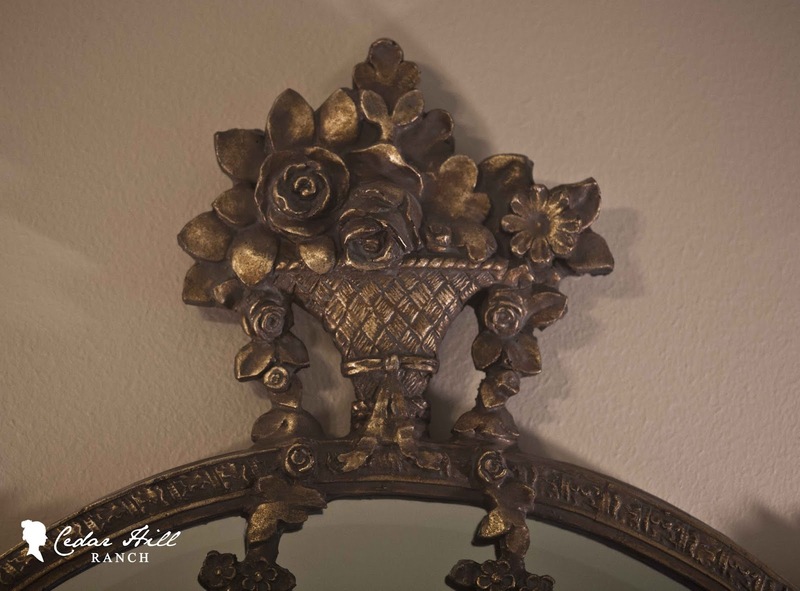 Here is some of the detail of my French mirror. Mr. CH says he can't really see himself in it (it's too low) but this is on my side of the room, so I don't know why he's even looking in it. 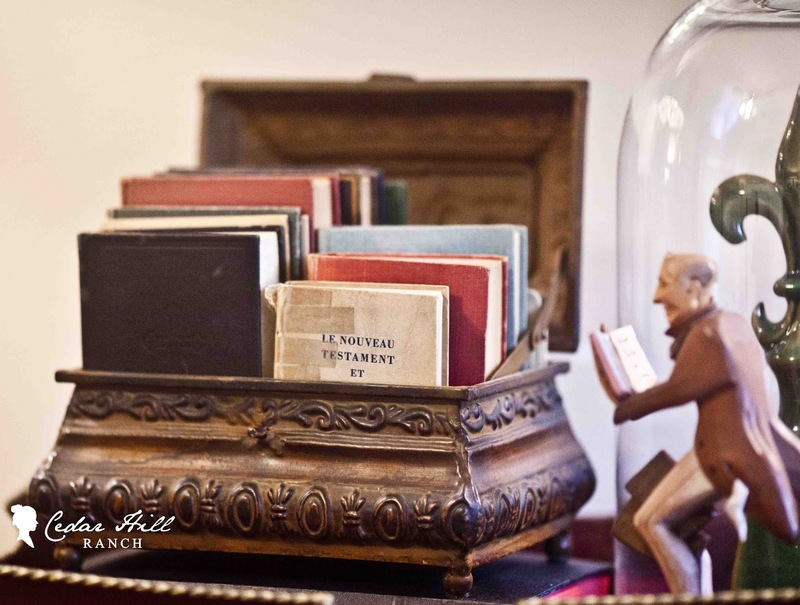 We have most of his dad's old books including the vintage French New Testament from the 1940's. This hand carved old guy also belonged to my father-in-law. Oh you have to go? So soon? But I was going to show you the whole house. Yes I know Kim said to limit it to one room, but I'm just getting started. What? You have an emergency at your home? Your cat ate what? Well if you have to go... just promise you'll come see me again at Cedar Hill Ranch. Come over any time, the door's always open. Thanks so much, Anita. I didn't know you were such a comedian. I know I only let you share one room. 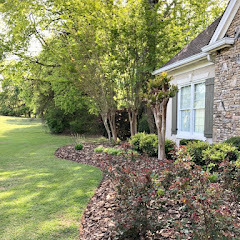 I sure hope my readers will hop on over and look around and see more of your beautiful home. I am also looking forward to following Anita's blog as they build a new city home. Y'all have a super weekend! Missed any of the old "favorite room" posts? You can find them all here. I can see why this room is her favorite! I'm not sure I could get out of that bed in the morning :) LOVE the bedding and the Louis chair and all the beautiful details that make the room so cozy and warm. Lovely! Thanks Kim. I always love coming over to your blog, and thanks so much for letting me share my room. Thanks for sharing such a cute blog. I'll have to check it out. 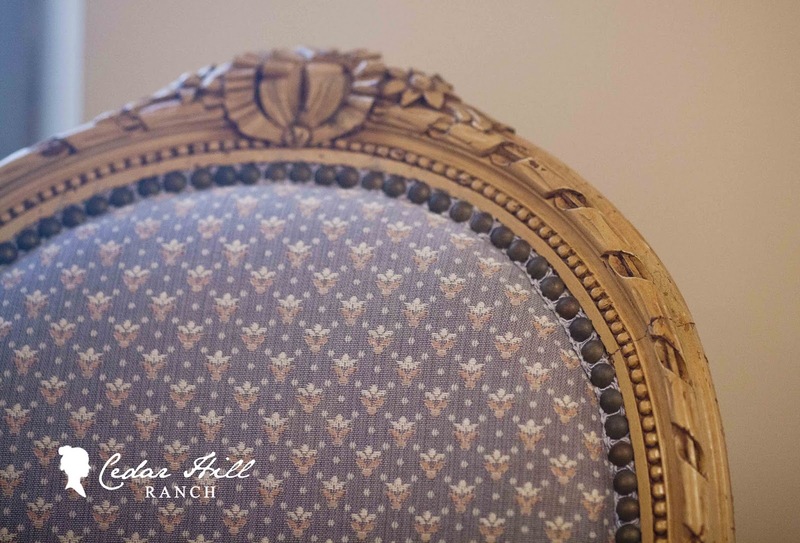 Love Cedar Hill Ranch....I can't imagine Anita having to pick her favorite room as all the rooms in her house are gorgeous...I am in awe of her many talents..she did a spectacular job on the window treatments, chair and that bedding!! !...So many wonderful treasures in that room ... if I had to choose my favorite item...it would have to be that French antique bedspread/duvet....exquisite! 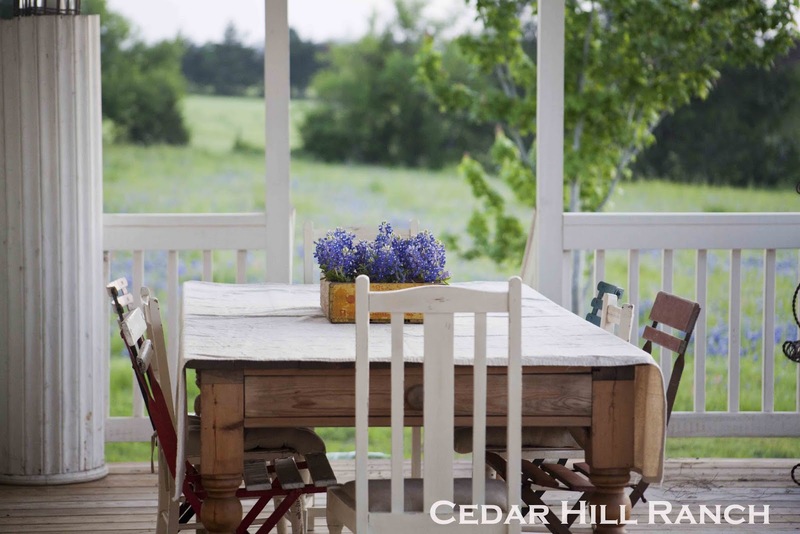 Anita, thank you for sharing your favorite room...and I cannot imagine sitting out there on your porch and gazing upon the beautiful blue bonnets! !....Kim...thanks for presenting Anita's favorite room...I so love this series!...Have a great weekend!! Love the slipcovered chair and ottoman. Off to check out the rest of the house. Oh my goodness so pretty!~ I love her bed and bedding. What a wonderfully decorated room! So inviting! You are so creative in making your own bed linen!!! And the chair in the corner is something every one would like to have! So beautiful! I wish I could visit Anita's house! 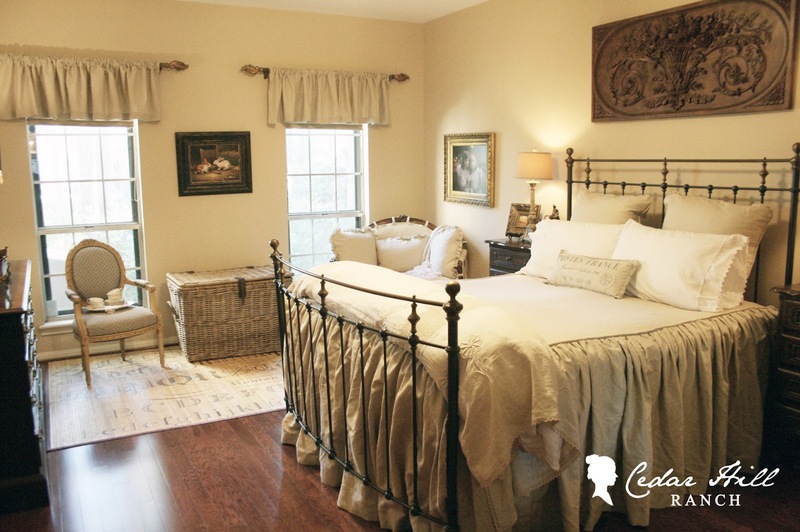 The bedroom is lovely, and my favorite part is that amazing-ly slipcovered chair. I had a feeling Anita would choose her bedroom. It is so beautiful!! I wish I had wonderful sewing skills. That is just gorgeous! 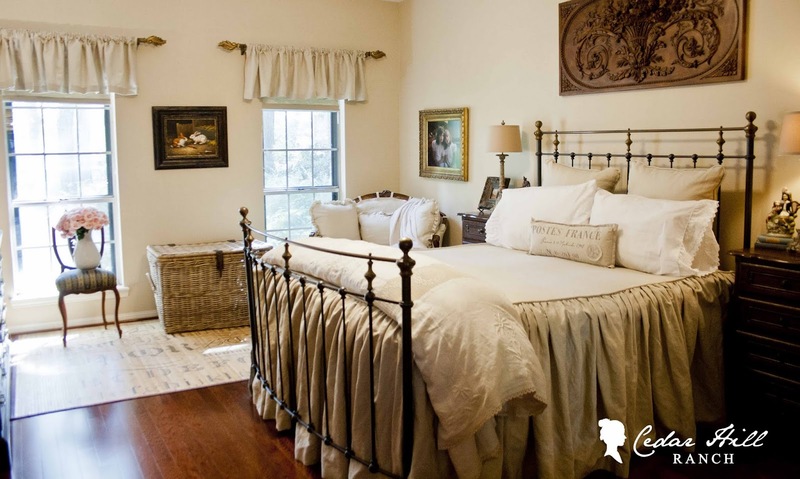 I am swooning over that iron bed & divine bedding!! What a charming bedroom! I love your bed and your bedding. It's so soft and romantic looking. I also love that mirrored armoire you have. Love, love the bedroom, especially the bed linen! Great room that is so peaceful and lovely! 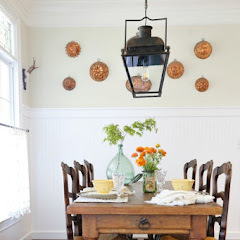 Love the neutral decor and the linen she used....its very charming. What a gorgeous, romantic room. Every piece is interesting, and you can tell it was collected with love over time. Beautiful! What a beautiful room - so much inspiration here. If I could do our room over again (and I just might) I would be following this colour story. 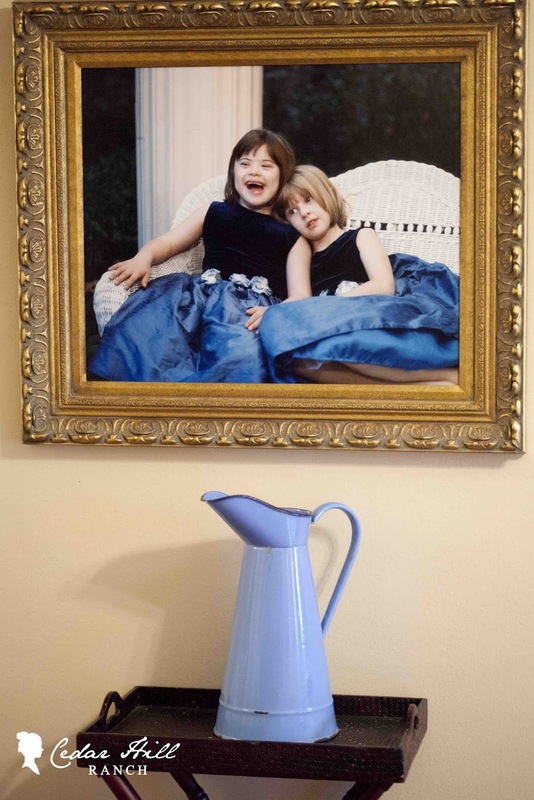 I loved seeing the big blue enamel pitcher - I have its twin. Thanks for sharing letting Anita share her beautiful bedroom. I think I would never leave that room too!!! So pretty, comfy and inviting. I love everything she has done in that room. Anita, Your home is so beautiful and inspirational! Thanks, Kim, for this wonderful guest post! Your home is so beautiful Anita.. I love everything Anita does, her home is full of amazing style! Anita is amazing....and she is so nice, too! Thanks so much for sharing, Kim! I LOVE this series! Ive been following Anitas site for a few months, and just love her posts! 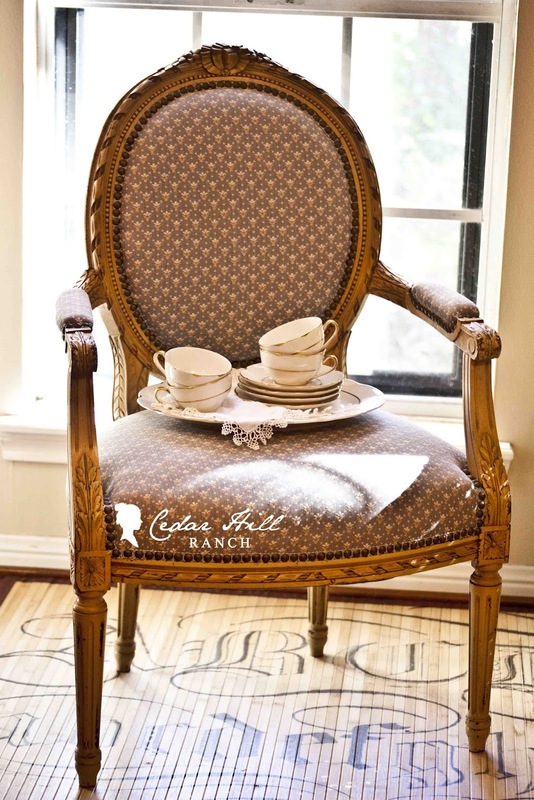 Anita, you know I adore everything at Cedar Hill Ranch. Your style is amazing! Love your bedroom. It's spectacular. 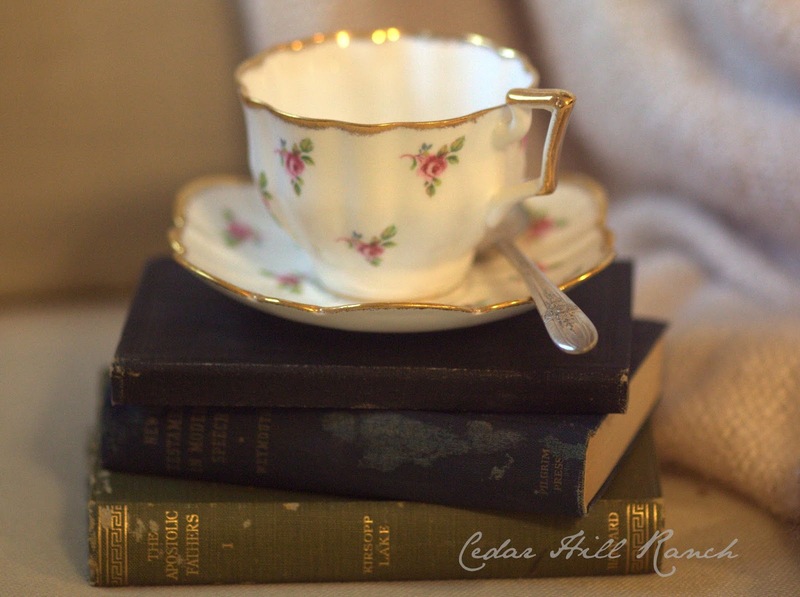 Thanks, Kim, for inviting Anita to guest post. She's one of my favorites. When I see a room as beautiful as this one, it makes me want to change my style and start over! I love the rug and the chaise. I don't sew at all, so I really admire those who do. I really enjoyed my tour! You have beautiful things. Hi Kimmie! 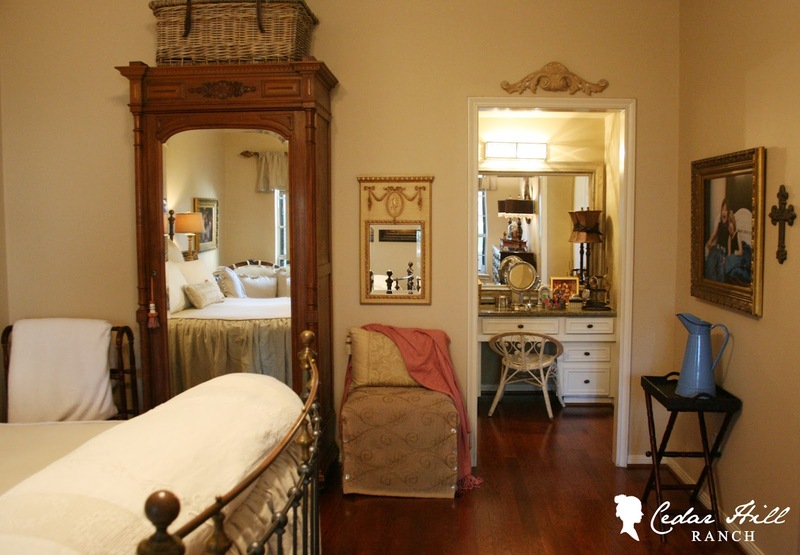 Oh, I love seeing Anita's home and this bedroom is gorgeous! 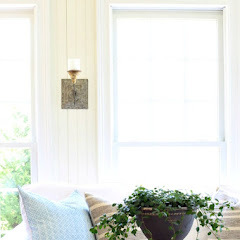 I love Anita's style, love everything about her beautiful home!! Gorgeous bedroom! I'd never leave if I had a room like this. Thanks for sharing. It's beautiful. this looks like a beautiful room to do some dreaming in! lots of pretties and family treasures, which i always love! Anita, Any room in your house is my favorite! Your lovely sense of style is a reflection of the lovely texas gal you are! I bet you have the sweetest dreams in this room! As everything you do... just beautiful!!! Thanks Kim for sharing Anita's room! Two of my favorite people in one post! My lucky day! Gorgeous room, love her over sized chair and ottoman! That is one beautiful retreat. I think I might never leave that cozy corner... except to stretch out in that amazing bed. Your bedroom is gorgeous and a great retreat. I have always loved that plaque from Ballard. I alos think the bed is so pretty. Great post. Love Anita! Love her blog! 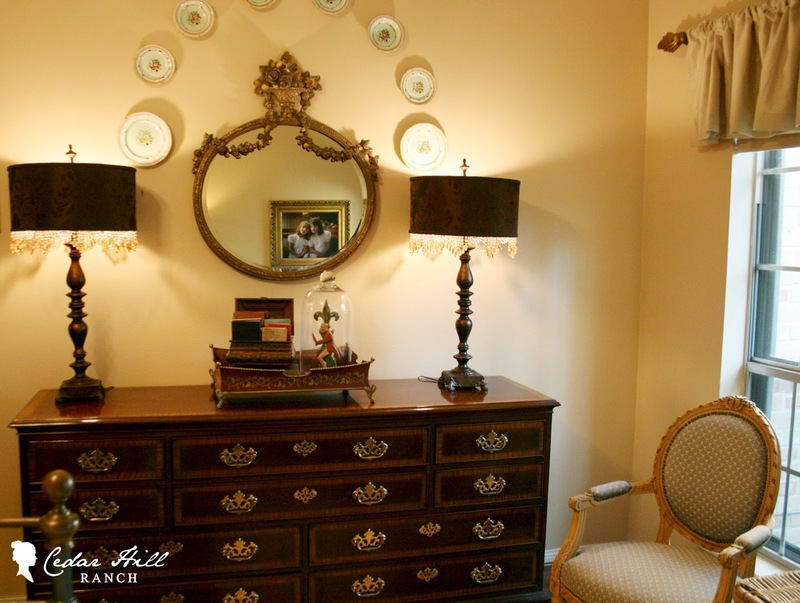 I witnessed the transformation of her bedroom through her posts about it. 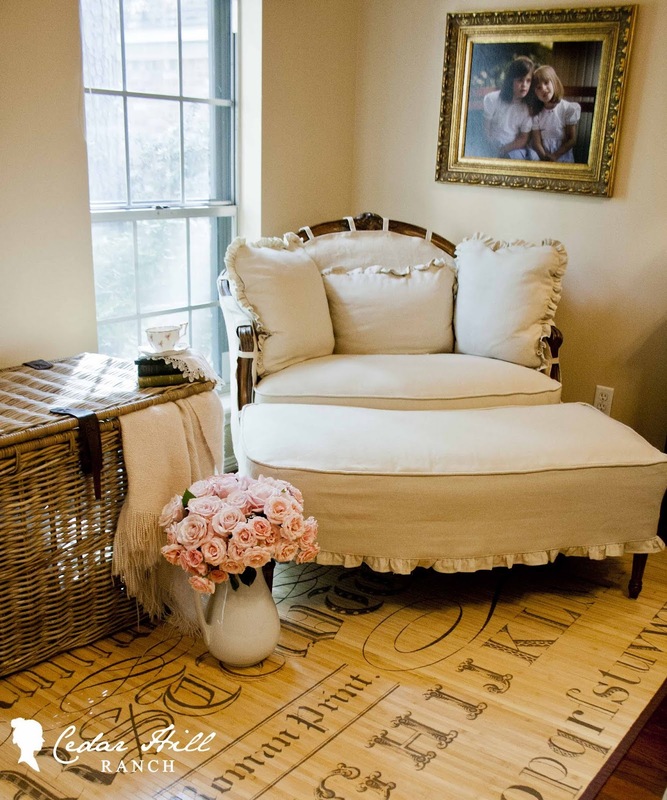 But what is most impressive is that she MADE the slipcover and some of the bedding. She's one talented lady! 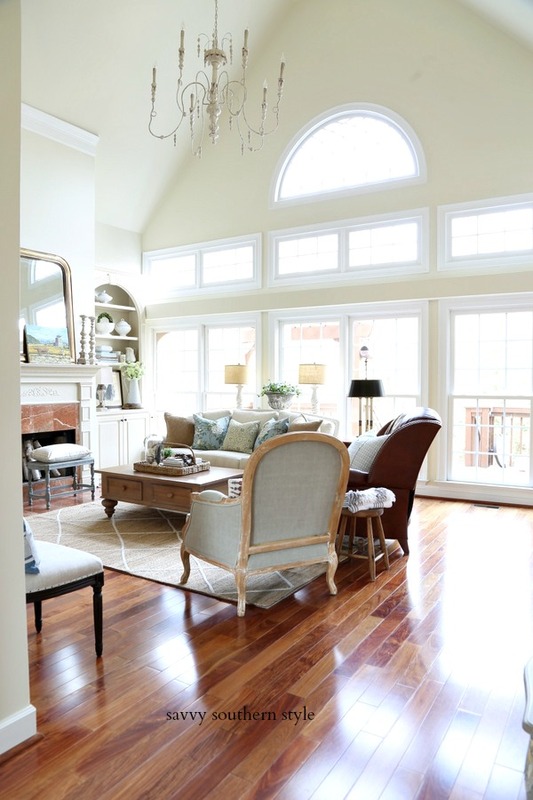 This is such a gorgeous and inviting room. I can see why it's Anita's favorite room! She is a talented seamstress and creative decorator! She just amazes me! I love every inch of this room! Oh wow, absolutely gorgeous, Anita! You have impeccable taste. (By the way, I have the small version of that typography rug. Love it!) This makes me want to work on our own bedroom, which we have sadly neglected. Anita has such a warm way with her decorating, I always love what she does. I love everything in that room, but that duvet is super yummy!! Anita's bedroom is one of my favorite rooms too! She made me believe I can make my own bedding and curtains and I have purchased all the fabric. She slipcovered the big chair and ottoman herself and gave a great tutorial! Thanks for sharing her beautiful room! Anita's bedroom is so beautiful Kim, thanks for sharing her with us. Hers was the very first link party to feature one of my posts, so I have an affection for Anita, although she may not realize it. :) Enjoy the rest of your weekend! 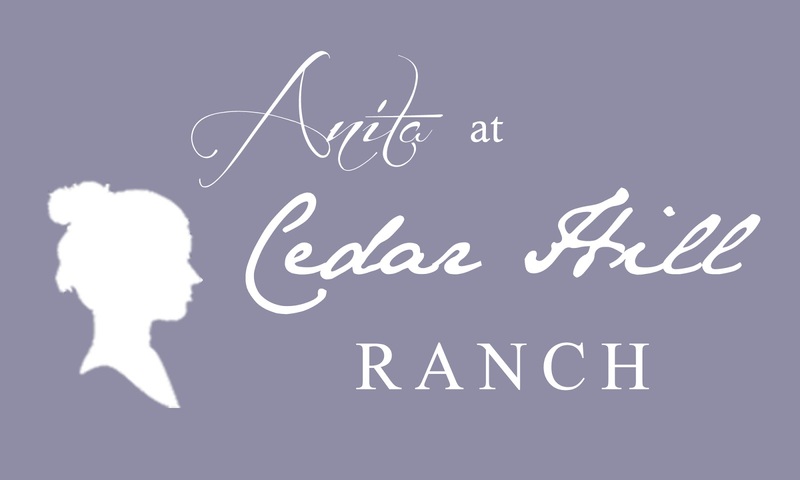 Oh I love Anita and Cedar Hill Ranch! Her home is just so so lovely! 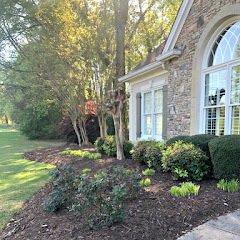 I never get tired of seeing Anita's beautiful home!Thank you for sharing it! 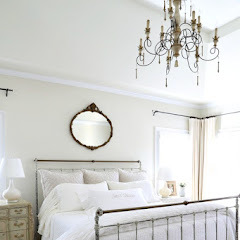 I love Anita's blog and enjoyed seeing her master bedroom here. She is such a sweetie, has a great sense of style, and is definitely a kindred spirit of mine since she loves French Country. Yes, I'm "eyeing" that bonnetiere!